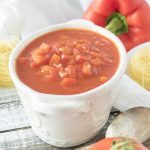 Roasted Red Pepper Tomato Sauce, an easy and hearty roasted red pepper sauce! 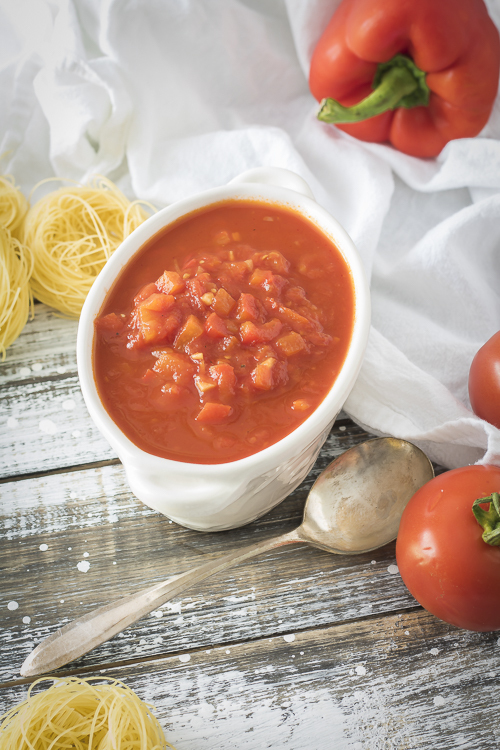 When you think of a classic marinara you probably wouldn’t think of a roasted red pepper sauce. But, you HAVE to try this version. Roasting the red bell peppers gives this sauce such a unique flavor. I love to use it as is over pasta, in a lasagna or even as a dipping sauce! 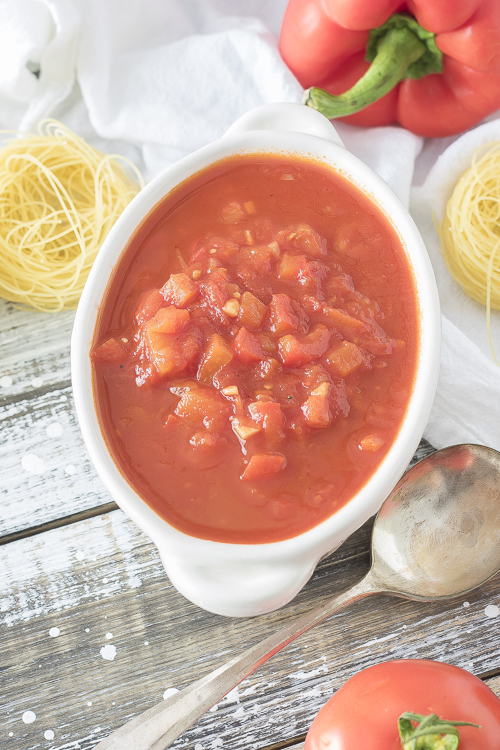 Our family has a long history of good spaghetti sauce. Normally it takes hours to cook. But, this version of roasted red pepper sauce is just as flavorful from those amazing charred peppers! If you’re in a pinch and can’t wait long enough for the peppers to char in the oven you can use store bought roasted red peppers. Or, another alternative is to use the broiler. Prepare the peppers the exact same way as the recipe states but just place them under the broiler on high. Be sure to keep a close eye on them, they char pretty quickly! Then, just go about the recipe as is! I really hope you enjoyed this red pepper tomato sauce. 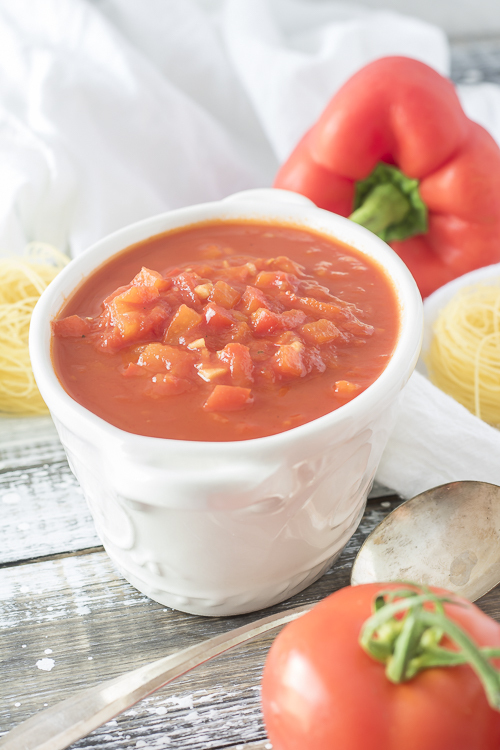 What are your favorite roasted red pepper recipes? For even more yummies, please visit my blog This Silly Girl’s Kitchen! See you there! Line a sheet pan with aluminum foil and grease it lightly with some olive oil. Put the peppers in the sheet pan facing down and roast them for about 40 minutes or until you see big bubbles forming under the pepper skin. Remove the peppers from the oven and close the foil over them. Wait 15 minutes and open the foil, peel the peppers and chop them finely. Heat the olive oil in a sauce pan and fry the shallots over medium heat until translucent, add the garlic and cook for 1 minute stirring. Add the chopped roasted red pepper and cook for 2 minutes. Add a pinch of salt and pepper. Add San Marzano tomatoes and bring to a boil. Reduce the heat to medium-low, cover and let it simmer for about 45 minutes. Taste for salt and pepper and add as necessary. Serve the sauce as is or blend it for a smooth consistency.